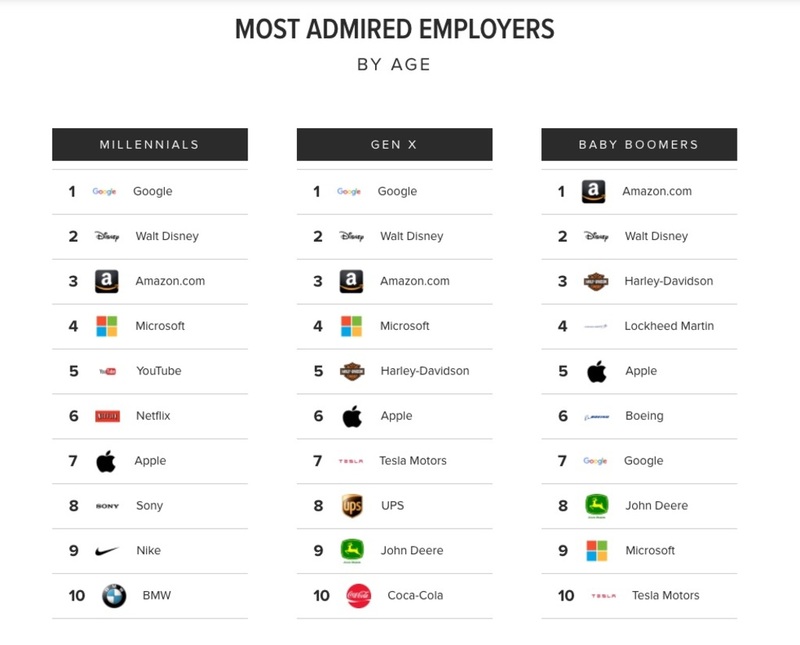 While both millennials and gen-Xers ranked Google as the company they would be most proud to work for (it came in at No. 7 among boomers), there are some generational differences/stereotypes to be found among Morning Consult’s Most Admired Employers. To reveal them, the nonpartisan survey company tallied 221,868 interviews with adults 18-plus across the United States. Amazon was No. 1 for boomers along with established corporate brands such as Harley Davidson, Lockheed Martin, Boeing, and John Deere. The one employer equally loved across generations was Disney, coming in at second place. Tesla, meanwhile, comes in at No. 7 for gen-Xers and No. 10 for boomers, but surprisingly doesn’t break the top 10 for millennials.